Villanova Wildcats forward Eric Paschall reacts after making one of his team's 18 three pointers against the Kansas Jayhawks. For the second time in the last three years, Villanova will be playing for the NCAA Tournament title after defeating fellow one-seed Kansas, 95-79, in the Final Four on Saturday night in San Antonio. The last time they played for a national championship (2016), Jay Wright's squad beat North Carolina at the buzzer to cap off an incredible run and bring 'Nova its first title since 1985. This time, they'll be facing Michigan, who beat Loyola-Chicago in the other Final Four matchup. They'll also have quite a bit of experience on their side, as three of their starters were a part of that 2016 team. The Wildcats will have more than just experience – they'll also have the Associated Press Player of the Year (and Naismith Award finalist), Jalen Brunson, who once again set the tone in their blowout win over Kansas with 13 first-half points. However, as has often been the case for Villanova this season, it was a team effort built around outside shooting. But even the most optimistic of fans likely wouldn't have predicted a performance like the one they put on against the Jayhawks. Likely because it's never been done before. Kansas got out to a 2-0 lead, but that would be their only one of the game, thanks to one of the more impressive three-point shooting displays of the season. By halftime, Villanova had built a 15-point lead – and already tied the record for the most three pointers in a Final Four game (13), originally set by UNLV in 1987. By the 16-minute mark of the second half, the Wildcats had not only set a new record for the most threes in a game, but also for the most in an entire tournament (and an entire season). As we said before, it really was a team effort for 'Nova, with six players scoring in double figures. In the end, the Wildcats finished with a record 18 three pointers on 40 attempts (45.0 pct.) and shot 36-of-65 (55.4 pct.) overall. Six players finished with multiple threes for the Wildcats, including Eric Paschall, who led all scorers with 24 points on an incredible 10-of-11 shooting (4-5 3PT). Brunson finished with 18 points and six assists, while freshman Omari Spellman finished with 15 points and 13 rebounds – as well as this thunderous dunk. Donte DiVincenzo added 14 points and eight rebounds, while Mikal Bridges and Phil Booth finished with 10 points each. Three-seeded Michigan, who was on hand to watch the Wildcats' victory, is going to have its work cut out in the title game. 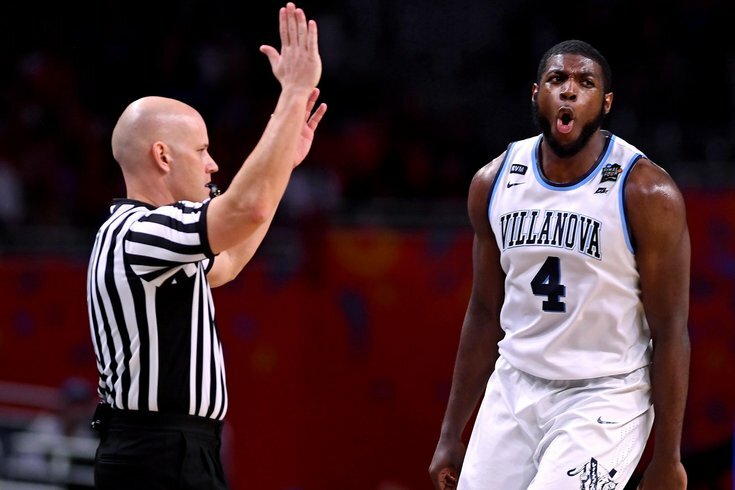 Another shooting performance from Villanova like the one we saw in the Final Four, and they'll likely be cutting down the nets again on Monday night.
.@BovadaLV has already moved the line to #Villanova -7 after previously being -6.5.